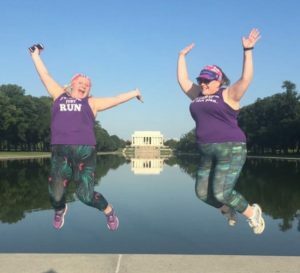 As we continue this months Too Fat to Run blogger takeover we feature one of our long-time members of the Clubhouse Jo Wheeler, who has been an amazing support to myself and others within the community. She is a force to be reckoned with and I am glad to be able to call her my friend. In today’s blog she talks about how to stop hiding away and start living…one of the major themes from my Living A Bigger Life Mastermind which Jo has been part of over the last 18 months. Hi I’m Jo and I live in Derbyshire, but I split my time between home here and in London where I work three days a week. I have run on and off for about 10 years, though I’m inconsistent – always stopping and starting. I completed the Great North Run in 2007 but since then I haven’t run further than a 10k and most of my runs are around a 3 mile plod. I was entered into the Cancer Research 10k in London on February 4th this year but then decided to get married on February 3rd. I reckon that was a pretty good reason to give up my place. I live with my new husband Patrick and our Labrador puppy Stella both of whom I hope to train to run with me – one might be easier than the other! At work and also in my personal life, I’m absolutely passionate about helping people to make changes and fascinated by the barriers to change and how we can overcome them. Based on what I have seen in so many different circumstances, I think confidence is a huge factor in how much success (however we define that) and happiness we have in life. 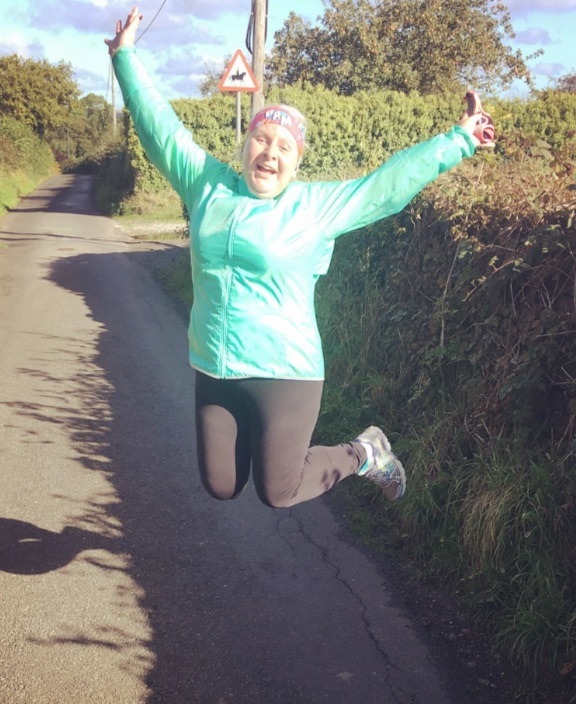 So many conversations I’ve had about running over the years are actually about having the confidence to get out the door and run and I’ve realised how much confidence – particularly body confidence – can help or hinder us in so many parts of our lives. The tragedy of not enough body confidence is not about lacking the courage to wear shorts or a swimsuit, the tragedy is when the way you feel about your body stops you from living the life you want to live. So where do you start if you feel like confidence is something that other people have? There’s no instant fix but here’s some things to think about that have and continue to help me. It is not our jobs to be cellulite-free, wrinkle-free, blemish-free, body-fat-free, hair-free and perfectly made up. Let go of the magazine definition or other people’s definition of beautiful. You can be sweaty, red-faced, make-up free, messy and scruffy and all of those things can be absolutely beautiful. There is enormous power and support to be found if you look. Seek out the people who understand you. If you try out a class or a running club and you don’t feel any connections there, that’s not your tribe so keep looking. When you find your tribe you will know it. 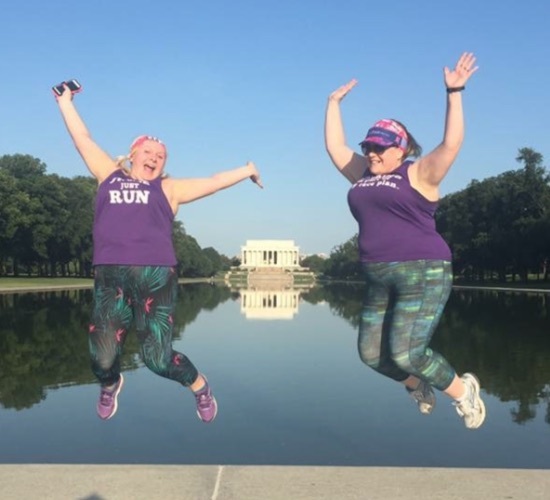 I knew it when I found the Too Fat To Run community and Julie Creffield and I wouldn’t be without it. In these warriors I find inspiration, understanding and support and the virtual friendships found there have spilled over into real life friendships too, so find your tribe. Start with small changes and work your way up. If you’d love to have the confidence to run in shorts, what’s the least scary thing you could wear on the way towards that? Cropped trousers, then slightly shorter, then capri leggings, then maybe long shorts? You don’t have to jump right in. Start with a small change and take your time. What would Beyoncé do? Or Madonna? Or whoever you imagine would be brave enough to do what you are fearful of. Nobody will know if in your head you are pretending to be Beyonce. Don’t tell anyone, but that’s what I do. If you don’t feel the confidence, nobody will know if you pretend you have it. There’s no outward difference between a person who is pretending to have the confidence to run in lycra and somebody who is doing it for real. If how we feel about our bodies is stopping us from living the lives we want to live, we have some work to do. Ruth Gordon said “Courage is like a muscle. We strengthen it with use.” So we should work at it, work together and keep practicing. 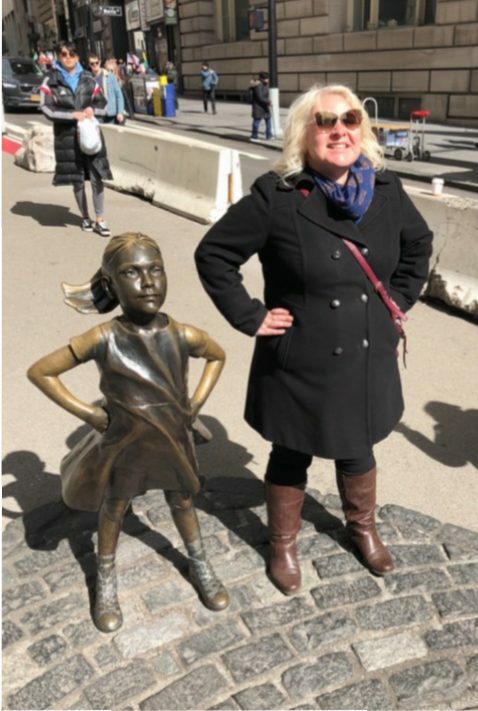 This is such a powerful post, and you are a wonderful role model within our community…your photo taking antics are particularly welcome and have taught me a thing or two about visibility.